Or, more appropriately, Mt. Ngauruhoe (pronounced "na-re-HO-ee"). 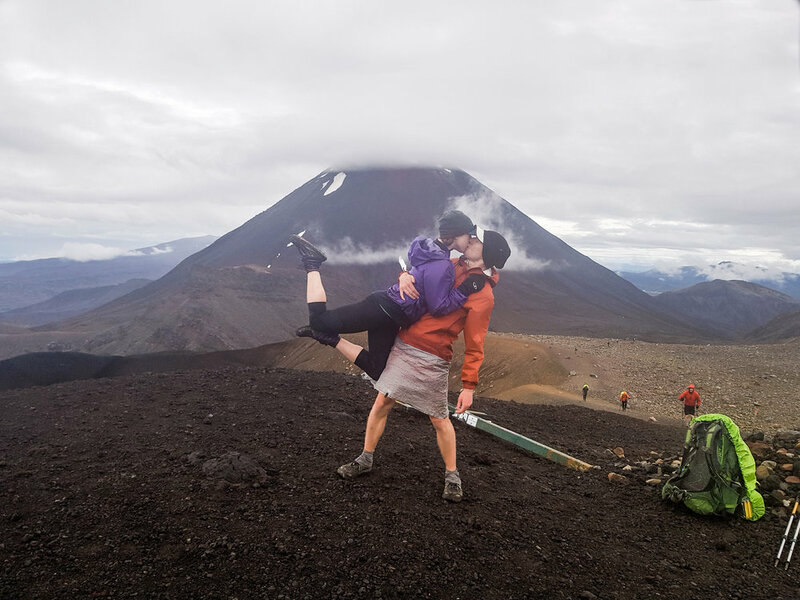 The famous mountain sits along the Tongariro Crossing, a famous track that makes up part of the Great Northern Circuit, one of New Zealand's Great Walks. It is a high alpine trail that passes through some of the most spectacular terrain on the North Island, topping out around 1850 meters (~5500ft). Mt. Ngauruhoe itself, famous -- of course -- for its role as Mount Doom in the Lord of Rings films, towers above at 2291 meters (~6900 ft). The trail also offers views over stunning alpine lakes and traverses the stark, barren volcanic landscapes used to craft the forbidding world of Mordor. Charlie, Jonathan, and I left the Tongariro Holiday Park around 5am, just before first light. As we reached the northern trailhead for the crossing, a cold rain began to fall. Charlie, a British hiker we met a few weeks back, getting a spectacular view of the clouds. Above tree level, where the wind whipped across us as we climbed, we took refuge in an abandoned hut to discuss whether to continue upward. This is the unglamorous part of being in the mountains: shivering in a drafty hut with goat poop on the table and trash in the corners, doing pushups to stay warm. Trying to stay warm in a very drafty hut while the deluge continued outside. With only a few kilometers to go before the high point of the trail and another hut (a maintained one) waiting for us on the other side, we decided to make a go of it. We soon warmed up again as we made the steep climb up to Blue Lake. And as we rounded the corner into a large crater, the rain stopped and the clouds began to lift. Though not exactly ideal, our wet weather did have its upsides: When the sun is shining, tourist buses bring hundreds of tourists to flood the trail in a giant train heading north. By the time we saw another hiker, we had nearly reached the trail's high point. In total, we saw maybe 50 people on the trail that day and later, learned that all of the buses had been canceled. 50 seemed like a lot to us until we saw photos of the trail from the day before, when the sun was out and the crowd was -- quite literally -- 10 times as large. Charlie presses on toward the high point, with no one else in sight. The climb to the Crossing's high point is steep and scree-covered, but it offers phenomenal views out over the Green Lakes, which stand out in seafoam against the reddish volcanic soil. As we reached the top, with Ngauruhoe looming above us, the clouds that had shrouded the summit all morning cleared away. We had a glorious, if suitably moody view of Mount Doom and the Red Crater. At last, we reach our goal. 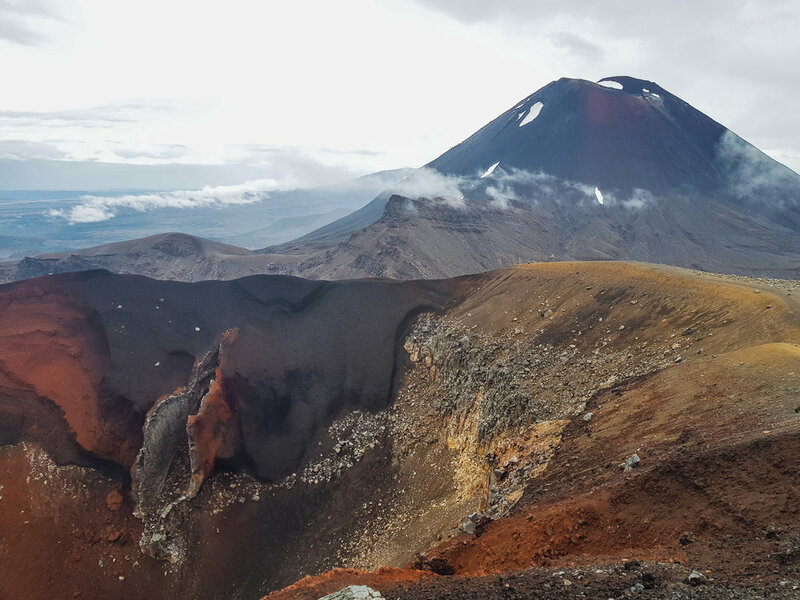 The epic views of Red Crater and Ngauruhoe. Obligatory selfie in front of Ngauruhoe (Mount Doom). Mount Doom seemed like a cool place for a #brinsonbanksing moment. 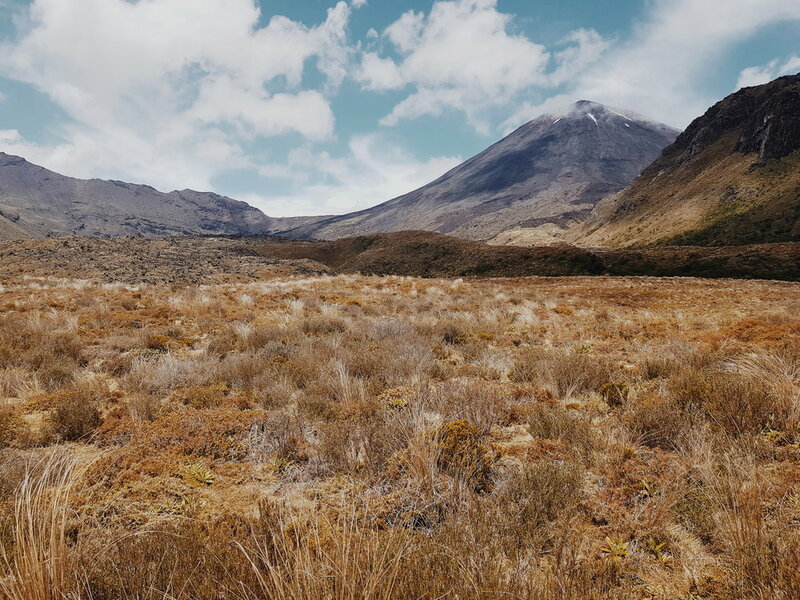 Ngauruhoe may have achieved international infamy as Mount Doom, but when you see it in person, it's actually dwarfed by a massive neighbor, Ruapehu. With a little window of time to spare before our date with the Whanganui River, we decided to trade a summit of Ngauruhoe for two days circumnavigating Ruapehu on the Round the Mountain track. More on that, coming soon! One last look back at Ngaruhoe as we descend off its flanks.